Welcome, everyone, to our group discussion of When Dimple Met Rishi by Sandhya Menon! If you haven’t heard of this sweet and fun contemporary romance, you need to add it to your TBR pile right away. Audrey: First of all, I just wanted to say that I loved this book so much! 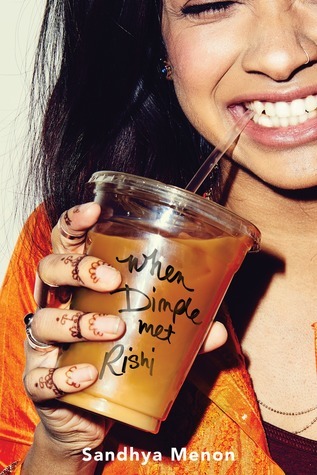 Dimple and Rishi are easily one of my favorite YA couples, and it was a delight to watch two Indian-American teens fall in love. Their romantic arc was basically all I could have hoped for: meet cute (well…messily), off-on-the-wrong-foot, one-sided pining, denial of feelings, ooops feelings, etc. It was refreshing and just plain fun. Crystal: I too loved the interactions between Dimple and Rishi. There was a wonderful balance of cringe-worthy moments and absolute adorableness. Everything wasn’t perfect, but there were so many lovely opportunities to smile while reading. This was one of my favorite books of the year. K. Imani: I agree with both of you. This was such a fun read and I fell in love with both Dimple and Rishi. I loved that their relationship wasn’t an “insta-love” attraction, but that it grew from true friendship. Because of that, their relationship was built on mutual respect for who the other was as a person and not “insta-true-love-forever”. Like any couple that wants the best for their partner, I loved that both Dimple and Rishi pushed each other to be their best selves and truly had each other’s back. The relationship that they developed is one I think will truly last and I loved it so much. Audrey: Dimple was a great heroine. Watching her push back hard against the perceived expectations of her mother was heartbreaking but also a familiar theme for teen readers. Her desire to be herself and fulfill her own ambitions and goals had me rooting for her every step of the way. Crystal: I enjoyed seeing Dimple push for the things she was passionate about. She has an intensity that serves her well most of the time. Also, since I’ve started teaching coding in my elementary classes, it was fun to see programming and technology getting a focus in a romance novel. K. Imani: Again, I agree with both of you about Dimple. I so felt for her in the conflict of her mother, and the complexity of their relationship. I also enjoyed that she was deciding to forge ahead with her dreams despite the expectations placed on her by her mother. I loved that she was so driven and focused and that her app was something that would truly help people. Dimple is a character that many teens can connect to and look up to. Jessica: Yeah, I enjoyed seeing programming and tech brought into the equation. I was a little wary at first, since a lot of YA seems to be trying to get in on telling stories revolving around social media or new tech or whatever, and it doesn’t always play out well – it’s hard to get right, and doesn’t stay current for long. But I think this book managed to pull it off, and it was interesting to see where that went. Audrey: While I enjoyed Dimple pushing back against tradition, it was also nice to see Rishi’s perspective. He found a lot of value in his culture and the traditions in it–including the possibility of an arranged marriage somewhere in his future, whether or not his encounter with Dimple worked out. I loved that we got different perspectives of their culture and their families and how the two of them helped each other. Jessica: Agreed on that front regarding different perspectives with one thing in common, the love and respect for their families. I’m really glad varying perspectives were raised. In general, there’s always that instinct to treat books involving different cultures as the One Perspective That Rules Them All, ignoring that culture is complex and people are complex — which of course, speaks to the need for many books with quality representation, instead of the one book that checks off the diversity box. By presenting different perspectives, When Dimple Met Rishi effectively points out that complexity, which I loved. K. Imani: I loved the contrast of beliefs between the two is what ultimately led them each to come to an understanding of themselves, their parents, and their relationships with their parents. Like Jessica said, there is no “One Perspective That Rules Them All” and the novel, the love story, is richer because of it. Audrey: One of the most interesting things to me about Rishi was how he had ended up placing a mantle/burden on himself about what his future should be and how that affected his perspective on his family, particularly his younger brother. I’m really happy about his character development in that regard. K. Imani: My heart broke for Rishi at many points throughout the novel because I felt like he was losing himself by taking on the burden for what his future should be, especially the way he referred to his art as a hobby when it clearly brought him so much joy. I’m glad that Dimple challenged Rishi to take “ownership” of his life and how her push allowed him to grow. Audrey: The competition aspect was a fun secondary element to the plot. It gave concrete goals (and obstacles) for Dimple and Rishi and also set deadlines for them and their relationship. I liked watching the two of them figure out how to work together and how they ended up bringing out the best in each other. K. Imani: Dimple and Rishi’s story reminded me a lot of K-Dramas where there is a meet-cute, and then the couple is forced to work together in some way to accomplish their goals while falling in love at the same time. I loved that the competition brought out both their strengths and their weaknesses because both Dimple and Rishi were able to be real with each other – see their positive and negative qualities. I felt like the competition allowed them to have a deeper connection because they had to use their combined talents to participate in the competition. Jessica: Ooh, I didn’t even think of K-dramas, but yeah, I can see that. Crystal: One thing that was surprising for me and for Dimple was Rishi’s ability to confront injustice and disrespectful behavior. Dimple is intense and Rishi is generally a much more relaxed type of person, but he does not let people push him or others around. His relaxed demeanor does not mean he is weak or doesn’t care. He steps up and doesn’t try to simply ignore or smooth over the bad behavior of others. He addresses it. K. Imani: I loved this character trait of Rishi! And he was always so smooth about it too which made the Amberzombies just look so foolish. This quality of his also was a lovely balance for Dimple and helped her with her confidence in dealing with the Amberzombies because she knew Rishi would have her back. Audrey: I cheered several times for Rishi because of moments like this. It was wonderful whenever he decided to step in, and I loved how he always backed Dimple. Audrey: One of my favorite things about the book was how both Dimple and Rishi reached out and tried to help each other achieve their dreams. There were several great friendship/romance moments because of it, and I was especially happy since they were both instrumental in each other’s success. Jessica: Definitely one of my favorite thing about any romance is the “they help each other be their best selves” kind of dynamic. The focus on Dimple and Rishi’s respective goals helped give their growing relationship some added complexity, which I loved. K. Imani: I actually loved that about their relationship because it showed what true friendship is like and that love can come as a result of friendship. When you love someone you want the best for them and the fact that both Dimple and Rishi wanted that for the other showed the level of mutual respect. And, that’s why I feel that Dimple and Rishi actually have the ability to make it long term because they are coming from a place of seeing the other for who they are and love the other because of it. It made their relationship true and real which was lovely to read in a YA novel. If you’ve read the book, we’d love to hear your thoughts on it! We hope you loved it as much as we did! I loved this book for all the reasons that you ladies mentioned. I also wanted to add the positive viewpoint of arranged marriage which was portrayed well in the book and is still an important aspect of the Indian Subcontinent culture.